Being a guy who primarily uses a portable Bluetooth speaker someone gave to me a couple years ago, I'm not in a position to test the claim. If the voices don't sound garbled or staticky, then they sound good to me. Nevertheless, Creative says the iRoar is "twice as powerful" as the original Sound Blaster Roar (which Cameron said was a pretty good speaker in his review) and comes with twenty hours of battery life. The core of the iRoar is a multi-core floating point SB-Axx1 processor that enhances audio. It's programmable, so buyers can customize the way their speaker functions. PC owners can also use the iRoar as a sound card. The speaker relies on a number of existing companion mobile apps to deliver the full experience. The iRoar Dashboard gives users a place to manage settings and switch profiles. Out of the box, the software comes with presets for music, gaming, and watching movies. The app also contains an equalizer for adjusting things manually and a megaphone mode that can morph voices in eighteen different ways. A separate Remote Assistant app lets users access files stored on a microSD card that's tucked away inside the speaker itself. 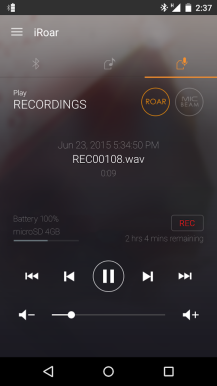 The option to record audio directly to the card comes included. The iRoar will go on sale January 14th, but you can place a pre-order now if you like. Thing is, it's going to cost you. Creative wants $369.99 for its Bluetooth speaker. That's quite a bit of money for a bunch of extra features you might say a product like this doesn't even need. MILPITAS, CA--(Marketwired - January 05, 2016) - Creative Technology Ltd today announced the Creative iRoar Intelligent Portable Bluetooth Speaker System. This compact multipurpose iRoar represents the next step in the evolution of portable speakers -- with its audio performance, expandability, intelligent audio processing, personalization and a collaborative open platform that allows for value-added third-party add-ons. And, it is twice as powerful as the original Sound Blaster Roar and has a huge 20-hour battery life. The Creative iRoar has been named a CES 2016 Innovation Awards Honoree product in the Home Audio/Video Components and Accessories category. The speaker will be showcased at CES 2016 -- the world's largest consumer electronics show. 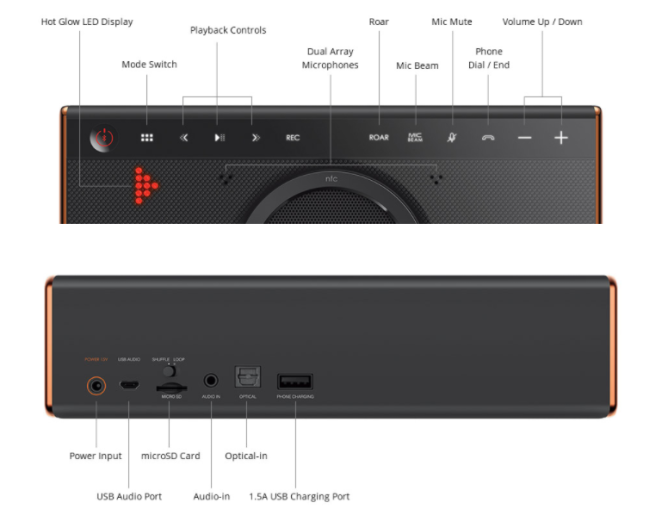 The Most Advanced Sound Blaster Built Inside At the heart of the Creative iRoar's intelligence is the powerful, flexible and programmable multi-core floating point SB-Axx1 processor. It is responsible for all the audio and voice enhancement, and proprietary effect processing, as well as an open platform that allows users to customize the behaviour of the speaker. The built-in processor also allows the iRoar to function as a high-end sound card. "The Creative iRoar is the most awesome portable speaker we have ever created. First of all, this all new intelligent speaker produces astoundingly powerful sound twice as loud as its predecessor -- it's like having two Roars in one. Besides its powerful performance, the most revolutionary aspect about the iRoar is the unsurpassed degree of customization it allows. With the incorporation of the intelligent SB-Axx1 multi-core floating point processor, and a smart device-based open-platform, users can now actually customize the speaker to function according to their personal preferences. Moreover, with the open SDK, developers and VARs (value-added resellers) can program the speaker for completely different applications. From simply retargeting the buttons to programming the speaker to do something very different; all these are now possible. Beyond software customization, the open DDK (Docking Development Kit) allows them to expand the speaker system's hardware through the docking expansion port according to their imagination -- it opens up endless possibilities to reposition this speaker for all kinds of uses and applications in their projects. Honestly, no other speaker comes even close, I believe it's certainly the most intelligent speaker on the planet," said Sim Wong Hoo, creator of the Sound Blaster and CEO of Creative Technology Ltd.
"The amazingly versatile Creative iRoar is also suitable for professional use. You could choose to connect to an iRoar Mic wirelessly and instantly transform it into a powerful, portable, hasslefree personal public address system that is very affordable. If you are a budding musician, the iRoar with the iRoar Mic lets you perform a gig anywhere, any time. You can even connect the iRoar to an iRoar Rock external subwoofer unit. Together, they deliver deeper and more powerful bass with greater immersive surround sound. And with the iRoar Rock, your gigs will really rock!" True to the award-winning pedigree found in the Sound Blaster Roar series, the top-of-the-line iRoar is engineered to take it even further with twice the loudness of the classic Sound Blaster Roar all without the need for doubling electrical power. This amazing engineering breakthrough is achieved through intensive research on speaker driver technologies, in conjunction with cutting-edge power amplifier circuitries, coupled with the integration of intelligent audio maximization technology via the processor-based BlasterX Acoustic Engine. This compact speaker actually features 5 speaker drivers, including a subwoofer: delivering over 40 Watts of sheer amplifier power. The lightweight speaker features dual lightweight highfrequency 2" drivers for projecting far-field high-frequency dispersion. It also boasts a top-firing 2.75" subwoofer that pushes bass upwards, plus two side-firing passive radiators to spread the bass out even farther. The iRoar also features 2 high-performance amplifiers -- one dedicated to driving lows and mids, another solely for delivering highs - producing clear, spacious, well-balanced audio without compromising on the bass. As a result, the iRoar is able to deliver powerful room-filling audio that you can enjoy anywhere in your room. The BlasterX Acoustic Engine in the iRoar is a technology that intelligently optimizes and maximizes acoustic performance of the speaker drivers and amplifiers connected to it. It ensures that each speaker driver is driven to its full potential without compromising audio fidelity. This transforms the bi-amplified 5-driver sound system into an awesome booklet-sized audio powerhouse that delivers powerful audio with big immersive virtual surround in a small enclosure. The iRoar is able to intelligently expand the dynamic range of audio. Since the 1990s, there has been a trend to increase audio levels in recorded music to compensate for the limitations of playback devices in general. This has been done by compressing the dynamic range which results in loss of dynamics where the difference of the loud and soft passages of a song is reduced, sacrificing the musical authenticity and, ultimately, listener enjoyment. With this in mind, Creative has designed an intelligent processor-based Dynamic Range Expansiontechnology into the iRoar that automatically analyzes and restores dynamics in compressed audio tracks in real time so that music and dynamics don't get sacrificed for sheer volume levels. The iRoar also includes Smart Volume technology that intelligently works in the background to minimize abrupt volume level changes during playback to prevent uncomfortable loudness shifts due to variations in loudness of recordings. The speaker also comes with the patented BlasterX Immersion technology based on Creative's proprietary CMSS™ (Creative MultiSpeaker Surround) technology. These technologies allow the speaker to deliver an immersive listening experience with a wider soundstage, far beyond the footprint of this speaker. Users can expect to be heard loud and clear in call with the Adaptive Noise Reductionand Adaptive Acoustic Echo Cancellation technologies in the iRoar. Furthermore, the iRoar's builtin microphones capture 360º sound around the speaker, or selectively within a certain focus range through the Mic Beam technology. When Private mode is activated, iRoar intelligently picks up and isolates the user's voice within a 30º acoustic zone in front of the speaker. Sounds from this zone will be captured clearly, with ambient noises or other voices reduced outside this zone. The built-in SB-Axx1 processor also enables users to activate the Voice Morph function to change their voice in real time for fun presentations and games with friends and children. When the speaker is used in a teleconference call, users can change their voices on the fly with the use of the iRoar Dashboard app. · iRoar Dashboard app The iRoar also comes with a suite of user-friendly iOS and Android mobile apps called the iRoar Dashboard that enables users to control the speaker remotely and adjust audio settings such as EQ, audio processing parameters, as well as microphone and voice controls directly from their phone with a graphically rich user-friendly interface - all at the touch of their fingertips. 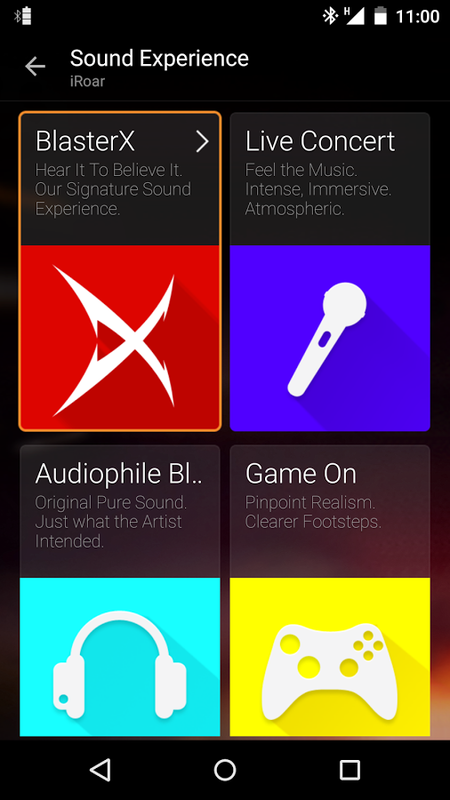 All these settings can be permanently stored in the speaker. Preset profiles allow for quick selection of optimized audio settings to match different types of audio. o Equalizer -- A graphic equalizer offers flexibility in adjusting the amplitude of audio signals at particular frequencies. o Immersion -- Utilizing BlasterX Immersion technology, enjoy true-to-life immersive audio with a natural sense of audio depth, spaciousness and surround effects from your content. o Dialog+ -- Enhance voices in movies, music or games for clearer dialog. Hear the dialog over the rest of the soundtrack and over ambient noise in your listening environment. The iRoar Dashboard also includes Smart Volume technology that intelligently works in the background to minimize abrupt volume level changes during playback to prevent uncomfortable loudness shifts due to variations in loudness of recordings. 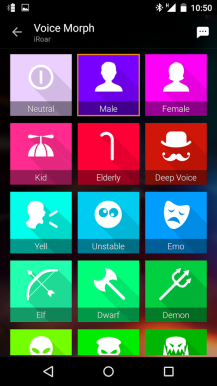 · iRoar Megaphone app Users can also easily access up to 18 Voice Morph options available on the iRoar Dashboard as well as the iRoar Megaphone app, great for having fun in a call or when the speaker is used as a PA system (public address system). 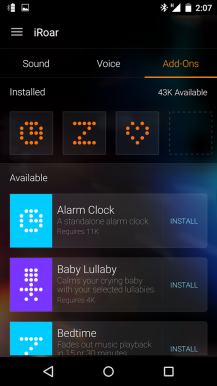 The iRoar is also smart enough to inform users when a firmware update is available when users connect to the speaker with their smart device using the iRoar Dashboard app. 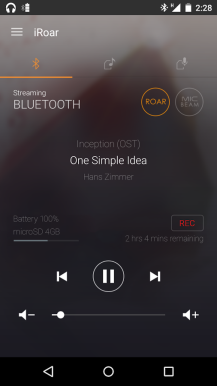 · iRoar Remote Assistant app This app turns an iPhone or Android device into an iRoar playback controller. 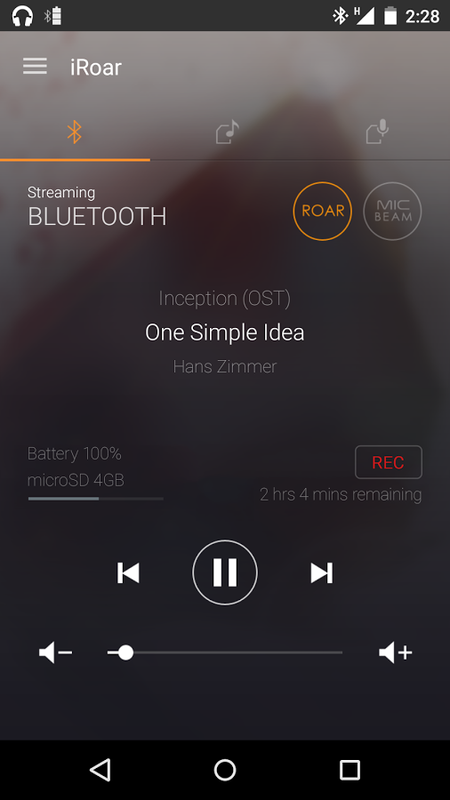 Rather than just playing back music from a phone's media library, iRoar Remote Assistant allows users to access audio stored on the microSD card within the iRoar. It shows the track and album of the track currently playing. With iRoar Remote Assistant, users can also trigger iRoar to record the audio sessions into the microSD card. The multipurpose speaker is designed to be expandable and work in a range of usages, as a standalone unit or as part of a bigger system. One iRoar can be connected to a second iRoar for an even wider soundstage and a more immersive listening experience. 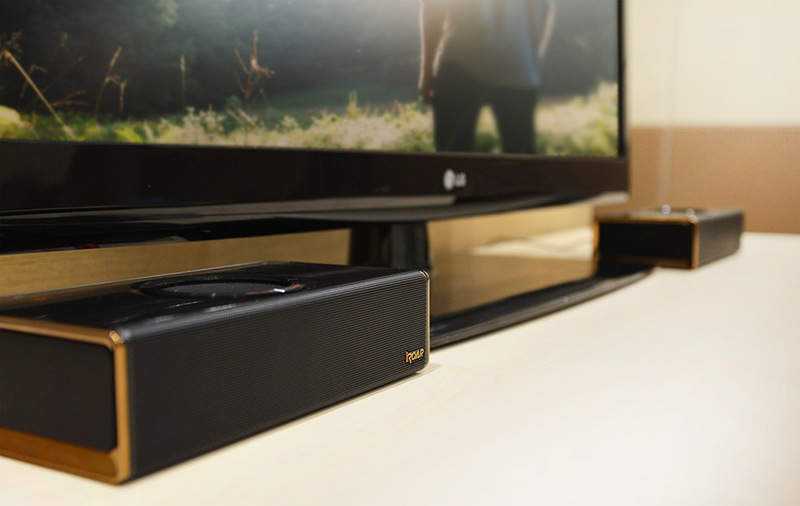 The iRoar can also be mounted on an external iRoar Rock subwoofer unit for room-filling audio with enhanced bass performance. Alternatively, when connected wirelessly to an iRoar Mic, the iRoar becomes a low latency wireless personal PA system or a portable Karaoke machine with high quality full audio bandwidth support. On its own, the iRoar delivers an amazing stereo audio performance. With the MegaStereo cable, users can link up two units of iRoar to create a mega stereo experience of dedicated left and right channels to experience a wider sound stage. And with a dedicated optical input, two iRoars can be connected to a TV for a great cinematic experience. The iRoar Rock external subwoofer unit is designed to be fully compatible with the iRoar, connecting easily though a docking expansion port. When docked, users can experience even more enhanced bass and immersive surround. This is made possible with the patented BlasterX Immersion technology in the iRoar and is realised in a larger form when docked on the iRoar Rock. While docked, the subwoofer unit also charges the iRoar at the same time. When on-the-go, users can simply grab the charged iRoar and go. Weighing at only 30 grams, with a talktime of 10 hours, the iRoar Mic can be held, clipped or hung for versatile and convenient speech delivery and performance. It features RapidTalk™ -- a patent-pending low latency high quality audio wireless technology that enables easy, quick and high performance sound transmission. The iRoar Mic also comes with a line-in jack that allows for music playthrough from a mobile device, giving users low latency Karaoke sessions. A mic-in jack also provides options to connect to an external dynamic or electret condenser mic. Controls on the mic enable quick volume adjustment as well as real-time voice morphing! The most intelligent feature of the iRoar is its unparalleled level of customization. Unlike any other speaker out there, the iRoar comes with an intelligent customizable open-platform that actually allows users to not only enjoy it as it is, but personalize and expand its capabilities. These include software Add-ons and an expandable hardware platform through the iRoar's Docking Expansion Port. This opens up endless possibilities for developers and VARs (ValueAdded Resellers) to virtually redesign their own portable speaker system by creating their own Add-ons, as well as hardware. The iRoar Dashboard app comes with a range of teaser Add-ons to inspire developers to create their own solutions. These solutions can be used in professional, industrial, personal, educational scenarios, or anything else they can imagine. Developers can go to http://developers.creative.com for updates. Sporting a contemporary minimalist design, the compact iRoar features a solid black housing wrapped in a carbon fiber finishing with dark rose gold trimming. The iconic ring in the centre of the speaker not only functions as an enhanced 'easy-aim' NFC interface, it also cleverly functions as an output for the subwoofer cleverly hidden underneath. It's a perfect fit for a modern office, studio apartment, or a dance studio. The iRoar features adaptive, context-sensitive touch controls that light up and turn off depending on the selected speaker mode. On the top of the speaker is an intelligent contextsensitive hot-glow orange dot-matrix LED that displays the mode or volume level the speaker is in. Near Field Communication (NFC) technology allows users to quickly and easily connect to NFC-enabled Bluetooth devices, requiring only a simple tap to pair and establish a connection. The wider, easy-aim NFC zone on the iRoar makes one-touch Bluetooth paring even faster and more convenient. The speaker is able to connect wirelessly via Bluetooth, and utilizes the aptX® and AAC codecs for high quality wireless audio. Users can also connect two Bluetooth devices to the iRoar simultaneously. The iRoar can easily connect to a PC via USB for precise low jitter asynchronous USB audio. An optical-in port provides lossless digital audio streaming from a smart TV or game console. · Integrated MicroSD AAC, WAV and MP3 Player Beyond wired or Bluetooth connectivity, the iRoar also comes with a built-in convenient microSD slot; the integrated player supports a microSD card of up to 32GB and can playback AAC, WAV and MP3 files directly from the memory card. · Integrated Advanced Recorder The iRoar features an Integrated Advanced Recorder that utilizes the speaker's built-in microphone, allowing for versatile one-touch recording of all kinds of audio - calls, external voices, or streamed music - directly to a removable microSD card. The feature is ideal for recording voice memos, interviews, teleconferencing sessions, and business/corporate meetings. · Dual-Purpose Battery The iRoar also features a Dual-Purpose Battery. The large, built-in 9000 mAh Lithium-Ion rechargeable battery can provide up to 20 hours* of audio playback -- over two times longer than the classic Sound Blaster Roar. The battery can also be used to charge smartphones and tablets. * Actual battery life will vary with use and settings and environmental conditions. The Creative iRoar will be demonstrated at the Creative Labs, Inc. Booth #30201 in Tech East, LVCC, South Hall 3, Level 2 at the 2016 International CES, which runs January 6 - 9, 2016, in Las Vegas, Nevada. Creative iRoar will also be displayed at Tech West in the Innovation Awards Showcase at Sands, Level 1, Hall G, Booth #83319. Pricing and Availability Creative iRoar is priced at USD369.99. It is now available at the online store at www.creative.com. Creative iRoar Mic is priced at USD79.99 and is now available at the online store at www.creative.com. Creative iRoar Rock subwoofer unit is priced at USD149.99. It will be available in the first quarter of 2016 at the online store atwww.creative.com. For in-country retail store availability, please refer to authorized dealers. For more information about Creative iRoar, visit www.creative.com/iroar.